We’ve got three issues from what are becoming the core books of this Pull List series of articles. The oldest title in the series is Teenage Mutant Ninja Turtles, which has been around since the first Pull List and 14 issues have appeared in 14 other pull lists, counting this one. 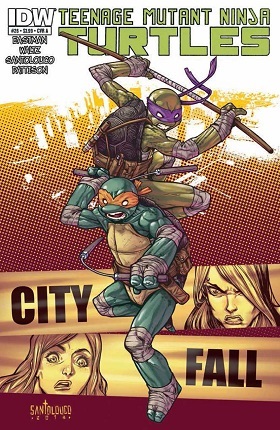 Eight spin-off issues, including the original Micro-Series, the Villains Micro-Series and The Secret History of the Foot Clan have also appeared in seven Pull Lists, bringing the total TMNT number to 23 issues in 22 Pull Lists. 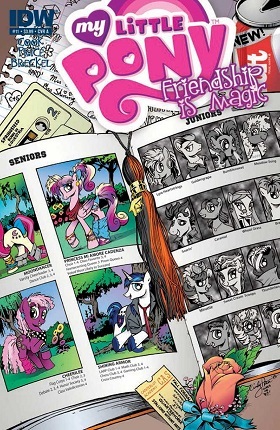 My Little Pony: Friendship is Magic began at the beginning with #1 in Pull List #6. Since then, 10 other issues have appeared in nine other Pull Lists, with seven issues of its Micro-Series featuring in seven Pull Lists, bring the franchise’s total up to 18 issues in 17 Pull Lists. The new kids on the block are the Guardians of the Galaxy, with seven issues in seven Pull Lists and no spin-offs, so they’re also the easiest to keep track of. This issue is still mostly dealing with the fallout of the “Age of Ultron” event, that the Guardians of the Galaxy didn’t actually have anything to do with, but which they now have seen the effects of. That effect being Angela, a Spawn character, is now a part of the Marvel Universe. 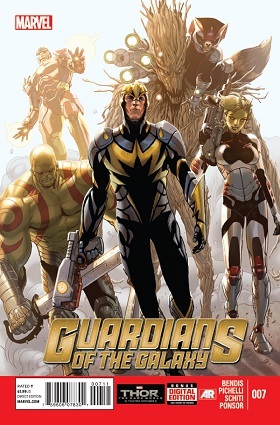 Now that the big fight is over, and Angela is safely behind some sort of weird force field, the Guardians try to interrogate her to find out what exactly is going on with this crazy, super powerful lady with a sword, and why she wants to get to Earth. She explains in flashback (to a world that is technically not owned by Marvel, which is something Marvel comics don’t usually get to do) she’s from Heven, which is a place in another universe that is basically analogous to heaven, except minus a vowel. She got sucked up into a bright light, and, bam, now she’s here. She’d thought this Earth place was a legend, so she decided, what the heck, might as well visit, and then the Guardians attacked her. Which, even Rocket admits, was a rude thing to do. An exposition heavy issue by Brian Michael Bendis could’ve been a disaster, but luckily, it manages to work, and each character has their own distinctive voices (something Bendis isn’t always the best at), except for Iron Man and Star-Lord, who sound exactly the same. Sara Pichelli and Valerio Schiti split art duties, with Schiti taking the flashback scenes set in Heven. Katie Cook and Andy Price are back for another My Little Pony: Friendship is Magic two parter to finally reveal the true story of how Shining Armor and Princess Cadance first met. Despite the fact that the show did a pretty good job explaining that. She used to babysit (I’m sorry, that’s foal-sit in “Ponyese”) his little sister. Pretty self-explanatory. Twilight Sparkle herself points it out in the opening, before it becomes a flashback issue. Well, it turns out Shining Armor was a nerd back in high school; he hung out with a pony named Poindexter. That about says it all. He decides his crush on the popular girl Princess Cadance means they are meant to be together forever, and his Dungeons and Dragons (I’m sorry, that’s Oubliettes and Ogres in “Copyrightfriendlyese”) buddies decide to help him win the girl over. It doesn’t start so well; after his first conversation with Cadence, Shining Armor’s line is “nailed it,” which by the ancient and venerable rules of comedy clichés is never, ever uttered by a character who has done something well. At the end of this issue, all hope seems lost; will Shining Armor and Princess Cadance ever be together? Spoilers! The issue ends with a short two page piece by Katie Cook involving the aforementioned Oubliettes and Ogres. It’s kind of cute, but it doesn’t really have a punchline, other than 8-bit (yes, really) the pegasus’ confusion over rolling die with hooves. After all the building up of recent issues, we finally begin to have a bit of pay off. Shredder makes his move on the Savate, while Splinter does his favor (stealing mutagen from Stockgen) for Old Hob. The actual turtles, however, are still in preparatory mode, with Raphael, Michelangelo and Donatello each reaching out to different characters from past issues looking for help to recover Leonardo. The action scenes are quick, and come in bursts; Old Hob, quickly becoming one of my favorite characters in this new series, even complements Splinter on how fast he was. Of course, that almost messes up Slash’s side mission to bomb Stockgen, but it still works out. Meanwhile, Shredder and Leonardo attack the Savate right in the middle of speech from that ninja team’s leader bragging about how the Foot will never see them coming. Whoops. Mateus Santolouco’s art is, as always, detailed and nice to look at. The action scenes are always kinetic, and Alopex gets to kick people in the face and look good doing it, so that’s a plus.